A very interesting read found over at Matthew Paul Thomas’s blog. The code is currently only tested under Delphi 2007, and the color utility unit implements a record with methods, so I guess that breaks older versions, but it is easy to change. I’ll probably add some conditional code for compatibility later. Details about versions downloading can always be found at http://fdclib.fosdal.com. You can download a .zip file or grab it with SVN from the repository at SourceForge. I haven’t created a download package on SourceForge yet, but that is coming as well. There are three very simple demos included in the demo/DemoFDCLib project. I’d like to add some more later, but I think they demonstrate the basic functionality for now. • DemoColorsViewClass shows how to implement a procedural color and contains $FFFFFF rows 🙂 Loading time is nonexistant. • DemoDirectoryClass is a small utility class that populate a TStringList from a directory path with wildcards. DemoDirectoryViewClass implements the grid controller for showing content from that extended string list. The default directory in the demo is “%temp%\*”, but feel free to experiment with changing it in the edit box. Let’s take a closer look at how to hijack a pristine TStringGrid and make it our playground without inheriting the grid directly. The VCL class is well designed for reuse and expose properties and event handlers that we easily can grab hold of. The OnDrawCell event is of particular interest to us. That’s a good spot to redefine how the grid retrieve and render it’s content. So this is where all the action is… err… actually, not much happens here. Instead we delegate the actual rendering to the column instance. The column instance then again divide the draw into two sections. The outer DrawCell does basic housekeeping of canvas color settings and a little color trickery (a feature that snuck in while I was having fun – my bad). Both these methods start in the same way. The default color have been retrieved from the grid itself in the outer draw. First we check if a color method have been plugged in, if not – we check if a column color override has been set. Too much flexibility? Well, maybe I broke the KISS rule, but no rule without exceptions 🙂 Now I can have static or procedural color adjustments per row as well as per column. There are a few practices that will help you write solid, maintainable, reusable code. A lot of software practitioners of greater fame than mine have written about these before, but it doesn’t hurt to repeat good advice. Reusable code should be kept low-feature. It can be a challenge to avoid feature creep and dependency bloat, so make an effort to follow the KISS rule. The more sophisticated stuff you add, the more you will need to “fix” and not to forget: Test! – when inheriting from the class. When you design a reusable class, you really have to define the scope of what you want to achieve. Decide on the basic feature set, then evaluate the possible offspring to this class and conceivable additional features, but to adhere to the KISS rule – you should not add the features until you need them. Instead, spend a little time on evaluating the impact of the features and put in any necessary hooks and leave enough comments to allow you to rediscover why you put them in in the first place. Later, if you absolutely have to add a feature and cannot add it in an inherited class – make sure you don’t break existing behavior in class instancing. A common mistake is to change a default property value in the base class constructor, which some derived class assumed had a specific state or value. I bet you never heard that one before! 🙂 Use Asserts to check your assumptions. It will save you from a number of embarrassing moments of broken code. The purists probably want this done in unit testing, but it can help add clarity to your code if it is done in the actual library code. Think of it as design by contract. For example – if you are writing a container class that will hold a polymorph collection of elements – you may want to have a virtual class function that return the default class type used to instance new elements in the container, instead of just instancing the base element class. Doing so will allow descendant classes make reliable assumptions about the safety of typecasting within the extended methods in the descendant container class. “But…” – you will say; “you can just override methods in the descendant class for the same effect?”. Yes, you can and it works well when you add new functionality, but what about functionality that already has been implemented in class higher in your inheritance tree? The base class won’t have an understanding of it’s descendants, so if you want it to be able to work with content from descendant classes, you would either have to override/redo the functionality or – do as above – allow the base class to work with their own child classes as well. This particularly goes for dialogs and forms that use a polymorph class – make a virtual class function to enable overriding the class instancing. Avoid the rigidly defined TSomeInheritableClass.Create constructs and call the virtual class type function instead. When I finally “got” OOP as opposed to structured programming, it was hard to drop the structured way of thinking when it came to instancing. Most of my classes would only have a constructor that took a ton of parameters to save a few lines at the point of instancing that class. It can be particularly useful to tie your business logic to your data and avoid implementing biz.logic in the GUI presentation. Your data will be easier to move to a different presentation form when the rules are not hard-coded in some draw routine. You don’t want to have duplication of biz.logic code between the display routines, the report routines, the export routines, etc. 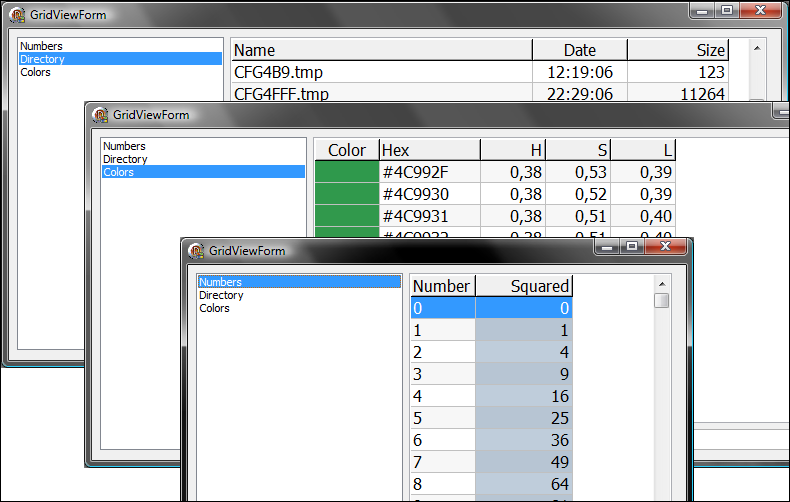 Our basic TGridViewController will hold a list of TGridViewColumns. I could make a simple array, or I could use TStringList. TStringList is probably one of the best and one of the worst classes in Delphi. So easy to use and so easy to abuse. In this case, I will only need to manage a handful of columns, instead of thousands of lines of text – so it will be ok.
On the abuse side: before you start filling TStringList – consider adjusting the capacity. Resizing the list is EXPENSIVE. Also – fill first, sort later. I won’t go into the details on the TGridViewColumn yet, but note the two abstract methods in the controller: DefineAttributes and GetRowCount. To make a working grid, these are what we need to override. The Grid property identifies the grid that we will control and DrawCell is the method we plug into the grid onDrawCell event. MakeColumn is called by the CreateTextColumn with the appropriate TGridColumnView descendant – hiding the interaction with our parent string list. I guess you already have figured out that IsEmpty simply check the number of rows. As you can see, there are a few tweaks that I haven’t described yet. Also, I still haven’t revealed the simple steps done to invade our host grid. A couple of years back, I set up a homepage with some forum software and tried to do some lightweight blogging – but – unfortunately the spammers really loved this free publishing mechanism and filled up my forum with trash. I ended up shutting down that project. But, as the saying goes – publish or perish – so here I go again but this time in a hopefully better protected environment. There are a lot of nice custom grid controls out there, but they all come at a price – either in the form of purchase, or in the form of having to invest time in writing glue to get your data in there, or even with cost of pure payload. Some grids are so function rich that they almost are a system in their own right. In a way, the top three goals are in conflict. How can you access content if you don’t know the format of the content? If you don’t know the format, don’t you have to convert it somehow, and don’t you have to store that conversion? If you don’t adapt the data to the viewer, how can you make a generic viewer? We need to find an effective way to encapsulate the data and present that encapsulation to the grid control. Let’s briefly look at the options for encapsulating the data here. Since I don’t want to duplicate content into the grid, I need to find a good way to retrieve what I need on demand and to massage it into the format I need to display it on the fly. The solution is to use something along the lines of a Visitor pattern. 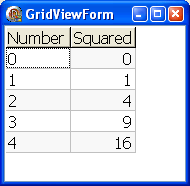 Since grid views typically have static columns – ie all fields in a column is of the same type – I will make the visitor look at the data from a column perspective, identifying which row it is visiting. This will be the column visitor (aka TGridViewColumn). 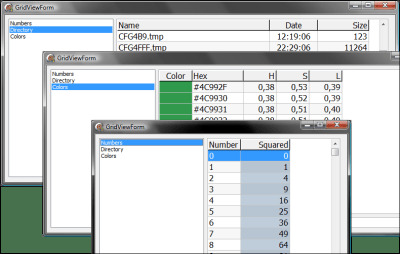 I will create different type of grid view columns for different type of data. String, boolean, integer, float, date, and even an image one – which basically is just the integer visitor with a custom draw. To avoid having to recreate the grid from scratch, I am going to attach myself to a TStringGrid. I am not going to inherit from it, just wrap it and inject myself where it counts. Why no inheritance? Well – I might want to move this code to a more capable grid at a later point in time. Also, by wrapping it – I can attach myself to a standard grid that is dropped in at design time without having to make a new component. This will be my grid controller (aka TGridViewController). My key point for doing all this is to be able to display the data as best as I can. Hence, I will replace the TStringGrid cell drawing routine with my own. Firstly, I need a new string drawing routine. I’m going to add center and right justify, so that it will be easy to convert a number to a string, and then draw the string right justified. Fortunately, TStringGrid.OnDrawCell allows me to do inject my custom draw without severe tampering with TStringGrid. I wasn’t going to put in a lot of bells and whistles in my reusable grid view, but one thing that I thought would be useful was the abilty to control row color and column color. If I am viewing some sort of log – it would be nice if I could highlight a row with a problem, or a row matching some sort of highlight criteria. Again – I want to give the controller the same ability to tie together the underlying data and the color changes, so I will use the same visitor model for retrieving the customized color. So- how about using a pluggable visitor routine instead? That way I could actually implement the column data type column only once – and only add a single visitor routine in the custom GridViewController to retrive the actual value that is to be translated and drawn. The extra call overhead isn’t really signficant since we are not typically talking several thousands of calls, but usually just a few hundred. Hence the GridViewColumn now has it’s own property which hold the function used to retrieve the cell value from the GridViewController. That’s all for the first part. More to come.